Spain or Greece: which country is more expensive? This comparison of travel costs between Greece and Spain examines average prices across multiple categories. Please visit each country's individual budget page for more detailed information. Should you visit Spain or Greece? Deciding between Spain and Greece is a difficult one. The cost to visit each of these countries is comparable, and the ease of travel is also comparable. Each country has its own culture, history, and personality. Ultimately, you must consider what you want out of your trip. Look into the specific destinations and the itinerary you'd follow in each country. Also consider your timeframe. Both Greece and Spain have a lot to offer visitors, and the difference between the countries come down to their unique cultures, varied landscapes, and general personalities. When is the best time to visit Spain and Greece? Both Greece and Spain are beautiful places to visit during the shoulder seasons of spring and fall. During these times temperatures are pleasant and crowds tend to be less than the peak summer months. The summer season can get crowded with travelers and cruise ship passengers and prices typically peak during these times. Both Spain and Greece can also become very hot during the summer months so you must be prepared for the temperatures. Weather in Spain can vary dramatically depending on where you are geographically. If you're planning to visit the country during the winter months, it's best to head to the Costa del Sol and Almeri. In Northern Spain, many hotels and restaurants close during the cold winter months. Many places in Greece also close during the winter months and ferries run less frequently making travel difficult. For most, it is best to avoid these areas during the off season. Also take note that hotels in Greece can fill up quickly during the week of Easter, particularly in and around Athens. Hotels and restaurants in Croatia also tend to close their doors for the winter months so it is best to avoid these times. Why are prices in Greece and Spain comparable? Prices in Greece and Spain aren't dramatically different. Food prices and hotel prices are all comparable. Transportation might be slightly more expensive in Greece because most tourists are dependent on the ferry network or domestic flights to travel between islands. Trains and buses are the preferred mode of transportation in Spain. In both countries there is no shortage of budget accommodation, particularly hostels, and affordable restaurants are plentiful as well. Even in these country's most expensive cities, it's not hard to find a cheap place to stay or an affordable place to eat. What are the most expensive and cheapest cities and regions in Spain and Greece? In Spain, coastal cities and towns can actually be a bit more expensive to visit than the larger cities. The higher demand for accommodation can drive prices up, particularly during the peak times when most visitors visit. These areas feel the greatest impact of seasonal pricing, so if you're planning to spend a lot of time along the cost, consider when the best time to visit might be. In Greece, the popular island destinations like Mykonos and Santorini are usually more expensive than Athens. Hotels and hostels are pricier, as are restaurants. Cruises more frequently visit these islands which can drive up the cost of food and shopping. While cruise passengers do visit Athens, the city is quite large, so their impact on pricing is still minimal. 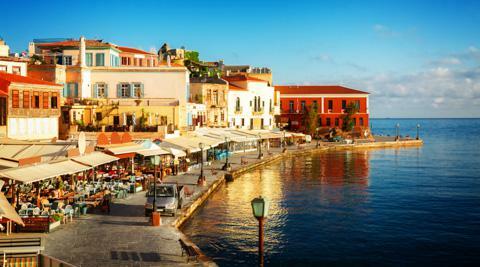 Traveling to and from the Greek Isles can also be expensive, increasing the entire price of your trip. How you can save money when visiting Spain and Greece? Travel during the shoulder seasons of fall and spring. Prices in both Greece and Spain are heavily impacted by the season, so choose your timing wisely if you want to get the most bang for you buck. Prices inevitably climb during the peak summer months, temperatures can become uncomfortably hot, and crowds are at their peak. Take some time to relax. Whether you're just hanging out by the beach or wandering around town, take a few days to explore the area and not just check items off your to do list. Not only will this refresh you, but it will also help you save some money. Stay with a local, or at least in locally owned accommodation. Locally owned hotels and hostels are some of the most affordable and often have the most atmosphere. Staying local also has the added benefit of keeping your money in the local economy.